After the 2016 elections, there was a tremendous uproar around the country that those in power just didn’t really represent many people in the country. And so activists, many of them new to the political process, started organizing. They joined local political groups, formed new organizations and even ran for office. The result, after Tuesday’s midterm elections, is government that looks more like the nation. A record number of women are heading to Congress, and at all levels, there are more women and minorities ready to serve. 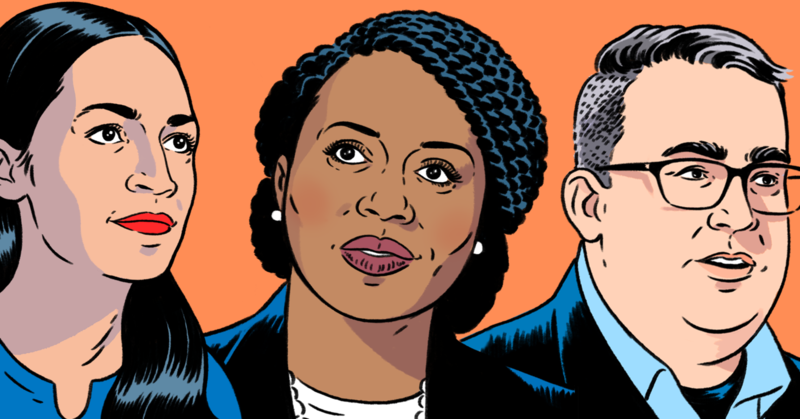 HuffPost profiled a dozen of these historic candidates, with illustrations by Kyle Hilton. Sharice Davids made history in more ways than one when she bested Rep. Kevin Yoder (R) in Kansas’ 3rd Congressional District race. The 38-year-old attorney and former MMA fighter will now be one of the first Native American women in Congress, joining Democrat Deb Haaland of New Mexico with that distinction. Davids will also be the first openly LGBTQ member of the Kansas congressional delegation and the first Democratic woman to represent her district. She is a member of the Ho-Chunk Nation. Texas is 40 percent Hispanic, but it has never sent a Latina to Congress — until now. Veronica Escobar, a 49-year-old former El Paso County judge, is the new congresswoman in the 16th Congressional District. Democrat Sylvia Garcia, in the 29th District, shares the historic milestone. Escobar’s victory will give the border district a Hispanic voice in Congress at a time of ferocious anti-immigration hysteria. Ilhan Omar, 37, will be the new House member for Minnesota’s 5th Congressional District. The state representative joins Rashida Tlaib in making history as the nation’s first Muslim congresswomen. For Omar ― who was born in Somalia and spent four years in a refugee camp in Kenya before coming to the U.S. at age 12 ― breaking barriers will be nothing new. When she was elected to the Minnesota House in 2016, she became the nation’s first Somali-American legislator. Alexandria Ocasio-Cortez, 29, is the youngest woman ever elected to Congress after winning the seat in New York’s 14th District. Ocasio-Cortez, a political newcomer, shook up the establishment when she unexpectedly defeated a 10-term incumbent in the primary, and she easily prevailed in the general election in the heavily Democratic district. Her win galvanized progressives across the country. Dave “Hutch” Hutchinson, a 39-year-old progressive, won his race for sheriff of Hennepin County, Minnesota, and will be the first openly gay sheriff in the Midwest. Hutchinson, who has spent 15 years as a police officer, faced off against incumbent Rich Stanek. Hutchinson called Stanek’s approach to policing “the ’90s model” and criticized Stanek’s meeting with, and praise for, President Donald Trump. Rashida Tlaib won her race in Michigan’s 13th Congressional District, facing no Republican challengers. The former Michigan state legislator joins fellow Rep.-elect Ilhan Omar in becoming the nation’s first Muslim women elected to Congress. Tlaib is also the first Palestinian-American woman elected to Congress. Ayanna Pressley will be Massachusetts’ first black congresswoman after winning in the 7th District. The Boston City Council member also broke barriers in 2009, becoming the first woman of color elected to that body. Pressley, 44, was a shoo-in to win the House seat with no Republican on the ballot, two months after her primary upset against a 10-term Democratic incumbent. Rep. Kristi Noem (R) is the first woman elected as governor of South Dakota. Raised on a farm in rural South Dakota, Noem served in the state legislature for four years before winning a seat in the U.S. House. She was the fourth woman to represent South Dakota in Congress. Noem, 46, faced a close race against Democrat Billie Sutton, the state’s Senate minority leader. Political analysts considered South Dakota to be among a number of solidly Republican states that could lean Democrat in the midterm elections. But in the end, the state stuck with the Republican candidate. Jared Polis’ win in Colorado makes him the first openly gay man elected governor in the U.S. The five-term congressman beat out Republican state Treasurer Walker Stapleton, a second cousin of President George W. Bush. Polis, 43, is a member of the center-left New Democrat Coalition, supporting single-payer health care and marijuana decriminalization. In 2017, he launched the Cannabis Caucus in Congress. Democrat Deb Haaland won her race in New Mexico’s 1st Congressional District and joins Democrat Sharice Davids of Kansas in becoming the nation’s first Native American congresswomen. Haaland, an enrolled member of the Laguna Pueblo tribe and former state Democratic Party chair, ran a progressive campaign focused on clean energy, affordable health care and fighting for the poor. More than 10,000 people have served in the House and over 1,300 have served in the Senate since the first Congress met in 1789. Not a single one was a Native American woman. First Black Woman Representing SW Pa. In the May Democratic primary for Pennsylvania state House District 34, Summer Lee, 30, handily toppled the 19-year incumbent. Lee will now be the first black woman to represent southwestern Pennsylvania in the legislature. An attorney and labor organizer, Lee had the backing of the Democratic Socialists of America and took on the establishment with a progressive agenda. Texas’ 29th Congressional District was drawn in 1992 as a majority-Hispanic district, but since then it has been represented by an Anglo, Gene Green. That will change when Sylvia Garcia, a Texas state senator, takes the place of the retiring Democrat. She and Veronica Escobar will be the first Latinas to represent Texas in Congress. CORRECTION: This story originally misstated the first name of Sharice Davids’ opponent, Rep. Kevin Yoder, as David.